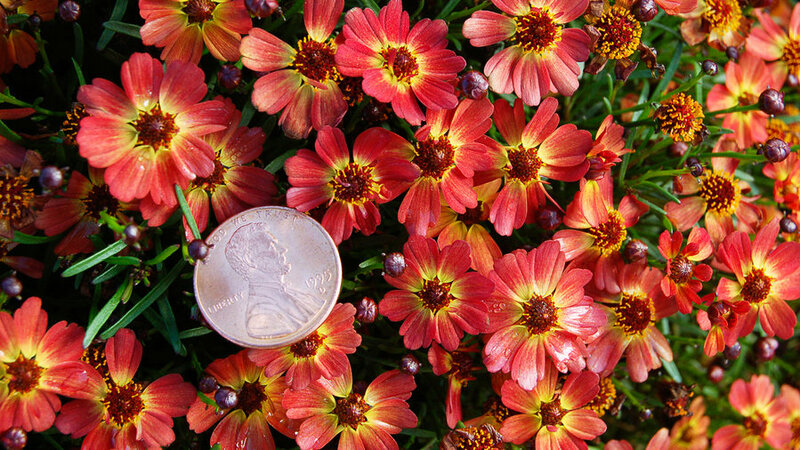 Coreopsis grandiflora (left), won't quit, despite heat or lack of water. Just plant and enjoy. 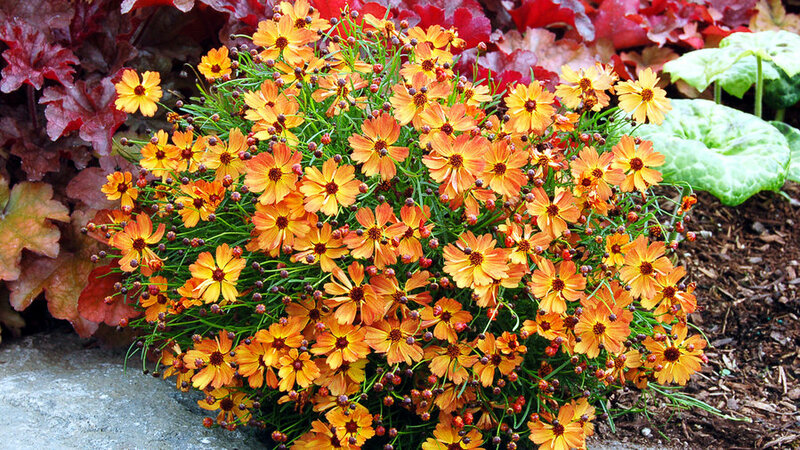 And now there's a Coreopsis to go with every color scheme, from pumpkin orange and vivid pink, some with chartreuse foliage. 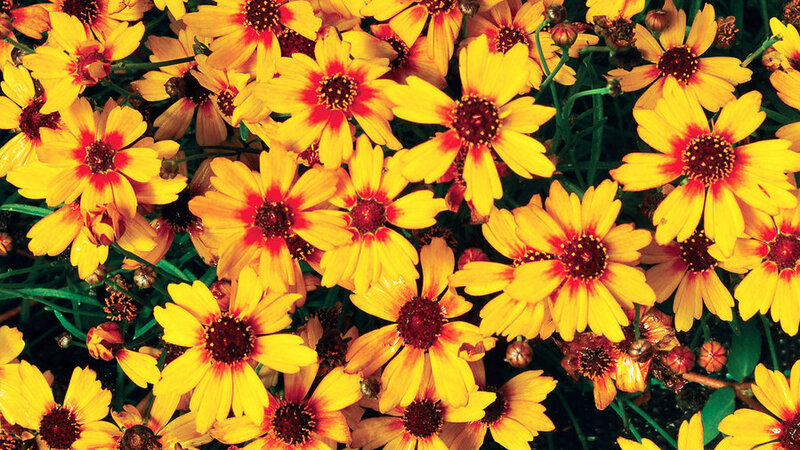 Oregon grower has 23 different Coreopsis varieties in production. Click ahead for our favorites. A compact (12 in. by 18 in.) mound covered with watermelon-pink flowers. Annual — can overwinter in mild climates. In cold climates, replant in spring. 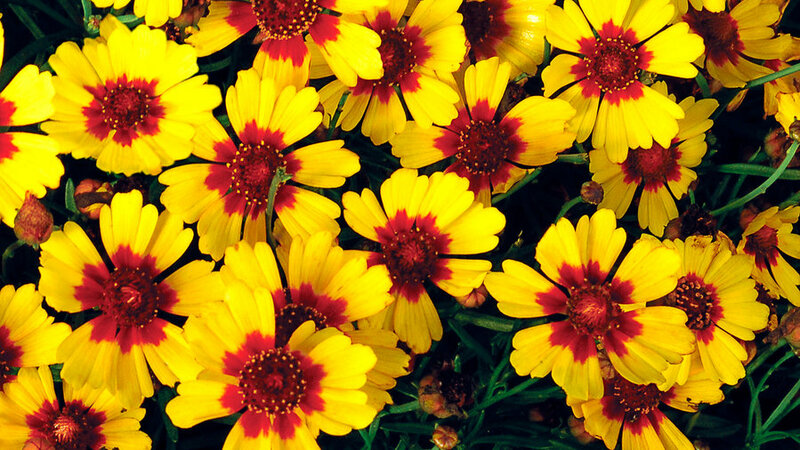 Pair with a soft yellow such as Coreopsis 'Moonlight', 'Summer Glow' , or 'Lemonade' . Or try with a solid lime-green . A compact mound (12 in. x 18 in.) blanketed with mango-orange flowers tinged with red. Pair with lavender or blue flowers such as 'May Night' or 'East Friesland' or a small such as 'Summer Sky' or licorice mint (A. rupestris). 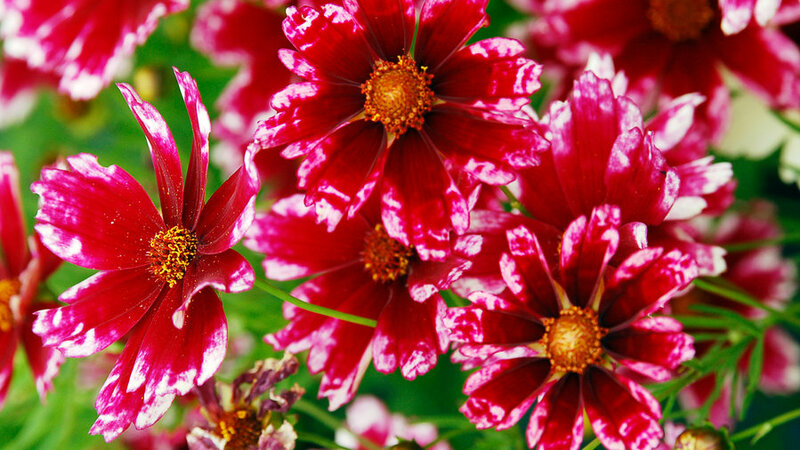 This variety of Coreopsis blooms dark pink with a delicate fringe of white. Perennial — it overwinters in climates without hard frosts (0 to -10 degrees). 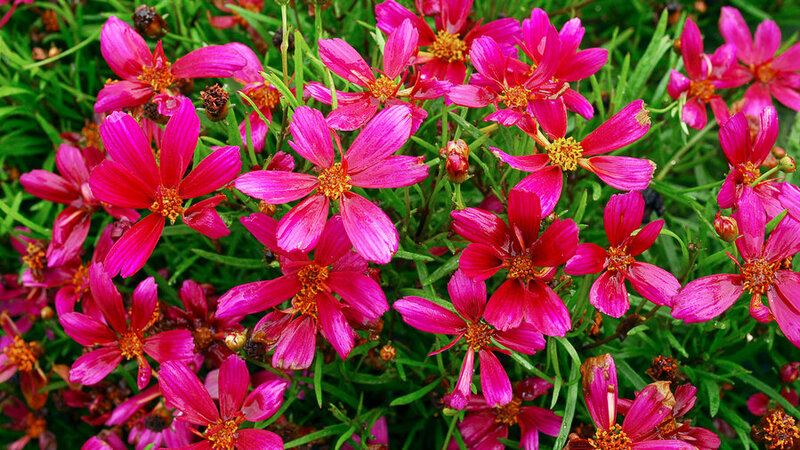 Hot pink Coreopsis looks good with sweet alyssum and 'Diamond Frost', or chartreuse 'Margarita' sweet potato vine. Low-growing (5 in. x 20 in.) mound covered with golden flowers with showy dark-red eyes. Annua can overwinter in mild climates. In cold climates, replant in spring. Pair with wine-leafed, yellow-flowered 'Zinfandel' or a small dark-leafed such as 'Cherry Cordial'. If you have room, add a taller brighter Coleus such as 'Pineapple Splash', which has yellow leaves and crimson veins, or 'Splish Splash’, which has burgundy leaves and yellow blotches. A low (8 in. by 16 in.) mounding plant covered with tons of small, copper-colored flowers. 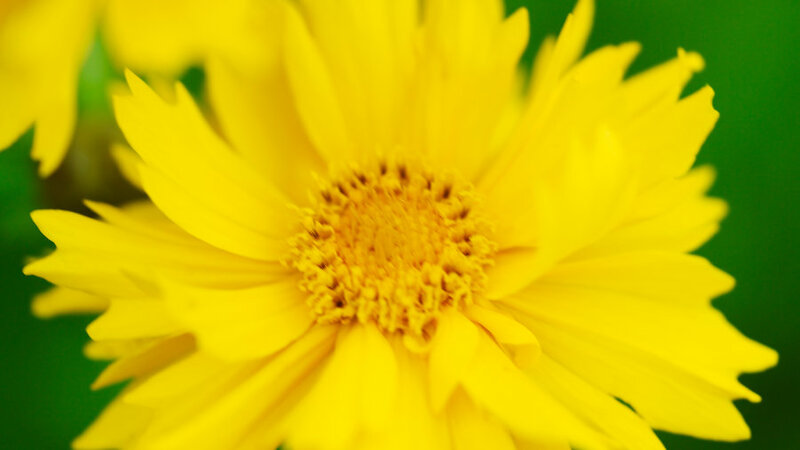 A ground-hugging variety (5 in. by 20 in.) with flowers the color of golden pumpkins. Pair with red-orange such as 'Tomato Soup' or 'Hot Lava' to add to the heat. Or cool down with blue asters or true . Low-growing mound (10 in. by 20 in.) with garnet-colored flowers. Perennial. Overwinters in climates without hard frost (0 to -10 degrees). 'Garnet' would be a great front row plant in an all pink border. Picture it backed by pink (Echinacea), Sedum 'Autumn Joy', and Agastache 'Raspberry Summer', for instance. But this dark cherry pink shade would work in just about any color scheme. A very low ground cover (5 in. by 20 in.) 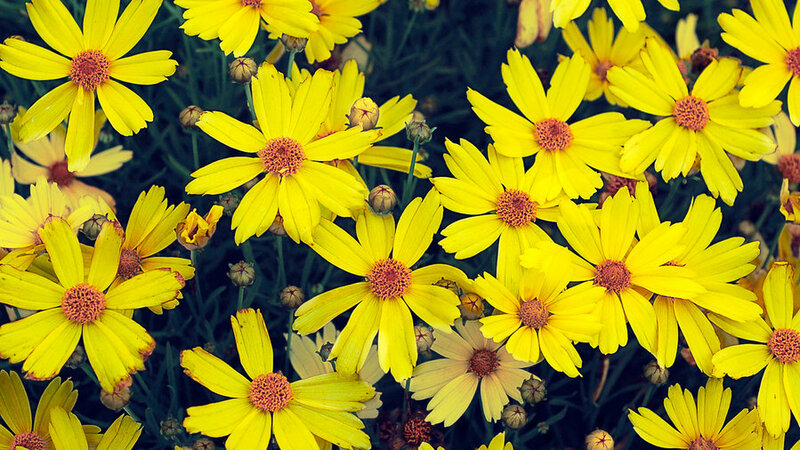 blanketed in bright clear yellow flowers. Perennial — overwinters in climates without hard frost (0 to -10 degrees). Use 'Citrine' as an edger in any border with a warm color scheme. 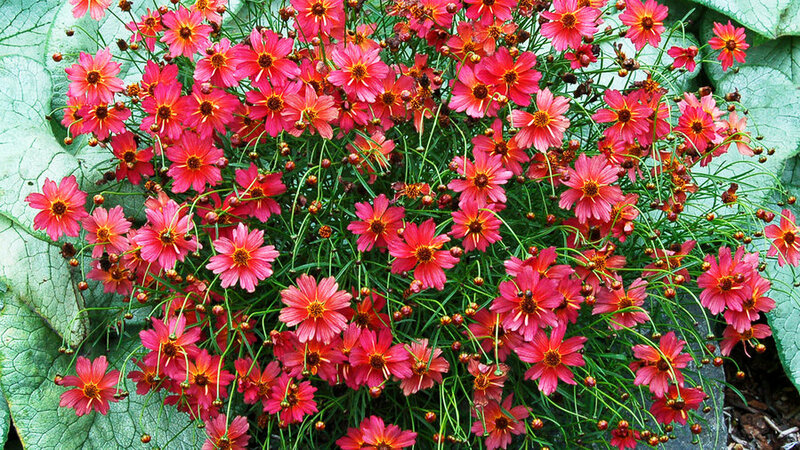 Or, if growing as an annual, make it the first row in an all-coreopsis scheme, backed by 'Rum Punch' and 'Autumn Blush'. A compact mound (9 in. x 14 in.) 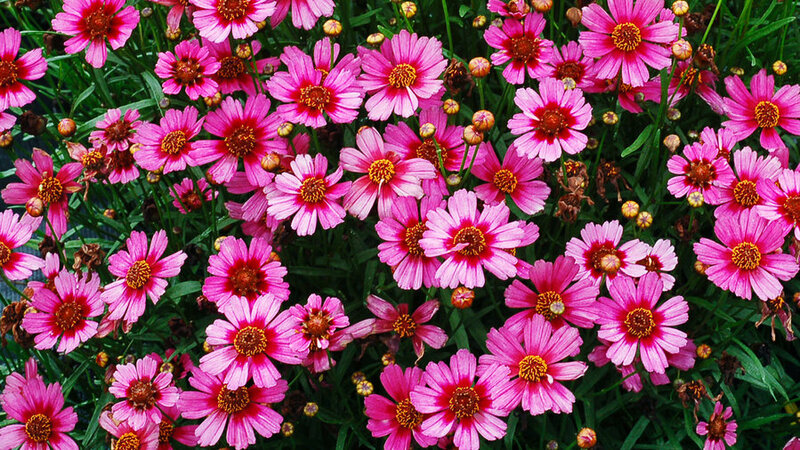 covered with dark rosy-pink flowers. A compact mound (8 in. x 14 in.) of chartreuse foliage and hot pink flowers. Annual—can overwinter in mild climates. In cold climates, replant in spring. For a strong contrast, pair with a dark blue such as 'Crystal Palace.' 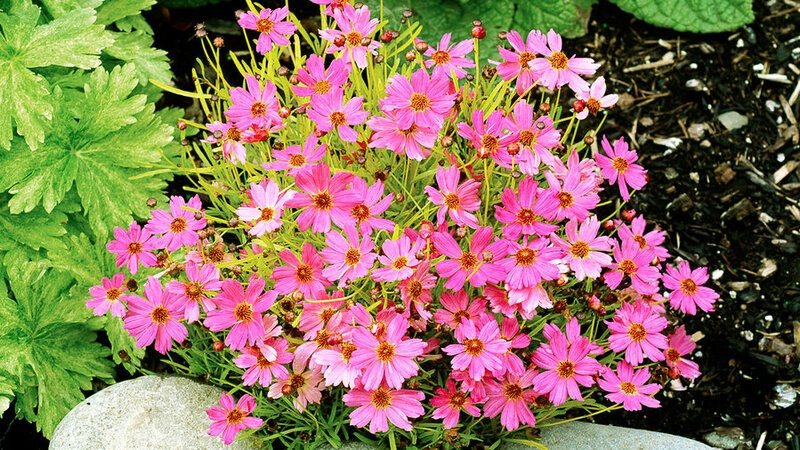 For a softer look, combine with a trailing soft pink, such as 'Rosie O'Day' . A compact mound (8 in. x 14 in.) 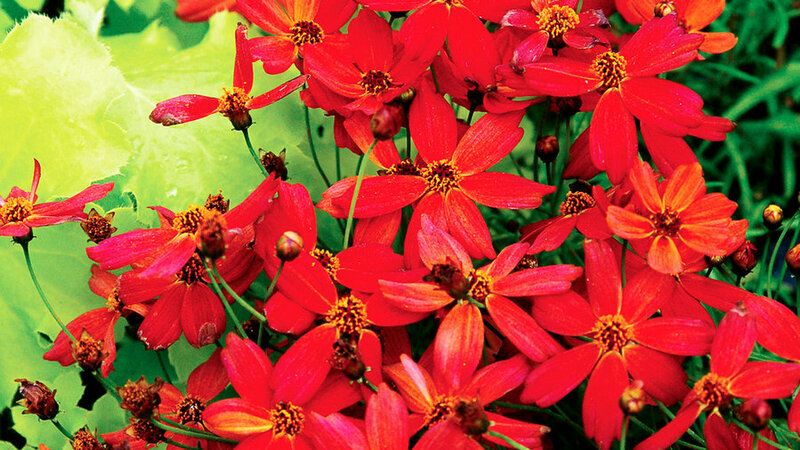 of bright gold foliage topped with red-orange flowers.